Blast from the past alert! Now that our blog readers are no longer just some of our college roommates and aunts who read our blog out of obligation, from time to time, we want to re-post some of our favorite recipes from the past that our newer readers may never have discovered otherwise. This is another Cooking Light superstar, with my own modifications. I love serving it at parties because a) it’s pretty much a guaranteed hit, b) it’s a cinch to prepare, especially if you use pre-grilled chicken and pre-washed, pre-chopped lettuce, and c) the dressing is low-fat and it is awesome. To. Die. For. I love the flavor of chipotle, but it is hot! Chipotle (which is pronounced chip-OAT-lay, just in case you’re wondering; I say that only because I have a former boss who would call people named José “Josie”) chilies are basically smoke-dried jalapenos. And here in the U.S., you’ll almost always find them in the Mexican food section, canned in adobo sauce. Now, if I weren’t such a pansy, I’d probably like the chilies themselves better, but alas, I AM a pansy, so what I’m after is the sauce. Don’t get me wrong, it’s still plenty spicy, just not burn-your-tongue/mouth/esophagus, let’s-induce-gastrointestinal-distress-spicy. The recipe I got this from actually had you chopping whole chilies into the dressing and suffice it to say that that was a teeny, tiny bit too spicy for my taste. If you do decide that you have tastebuds of steel, I recommend approaching using whole chilies the way you would jalapenos, especially since the adobo sauce has the tendency to stain your hands a lovely burnt sienna. I spent the afternoon coloring, can you tell? Anyway, I’ve yammered on enough. Let’s do it to it. Make sure all salad ingredients that need to be washed or rinsed have been. 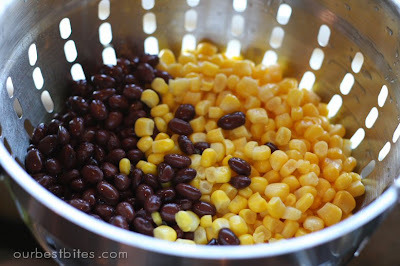 I rinse the beans and corn together; no reason not to! Heck, throw the tomatoes in while you’re at it if you want! Combine lettuce, chicken, beans, corn, onion, and tomatoes in a large bowl and gently mix with your hands (which you have obviously and thoroughly washed, of course! 🙂 ). Set aside. Mix dressing ingredients. I say to start with 1 1/2 tsp. of adobo sauce and then go from there, probably 1/4-1/2 tsp. at a time. If you’re serving this for a crowd, it’s probably better to err on the side of not spicy enough rather than too spicy, but if you’re just making it for your family and you have taste buds of steel, have at it. You could even chop up one of the chilies and toss it in there if you’re feeling super-brave. Then taste the dressing and you’ll know what heaven tastes like. Set dressing aside. If you’re making tortilla strips, fry those puppies up now. I didn’t make them here because I’m trying my darndest not to be naughty nutritionally, but if I make this salad for some kind of festivity, I always make the tortilla strips. Allow them to cool. When you’re ready to serve, add avocado, tortilla strips, and dressing. Gently combine and serve. Makes 4-6 meal-sized servings and 6-8 side-dish or party-sized servings. This looks so good, I’m goint to try it. As always, thanks! This is what we are having for dinner tonight. I’m so glad I found this recipe. This will be great to serve at my son’s birthday party! 🙂 Love your recipes! I can’t wait to try this! It looks absolutely delicious! This looks like it could be a new favorite. 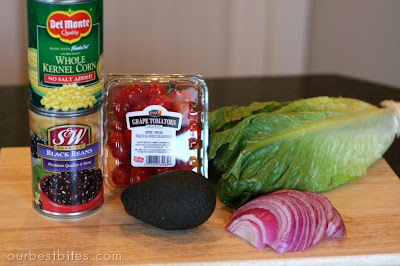 I love chipotle and am excited to have a recipe for chipotle dressing now! Love your blog…. 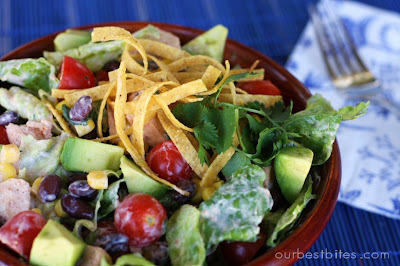 This is one of my (and my husband’s) all time favorite salads! Yum! I’m actually supposed to bring a salad for a baby shower next week. I think I may try this! This looks delicious. I make something similar, and add mangoes. I LOVE Cooking Light’s site and mag, and saw it online the other night and made it for dinner, without realizing you had already posted it! I chopped up a chili though to add spice, but it wasn’t spicy at all. I was worried that one chili would be too much!!! yum, yum, yum!This sounds awesome! 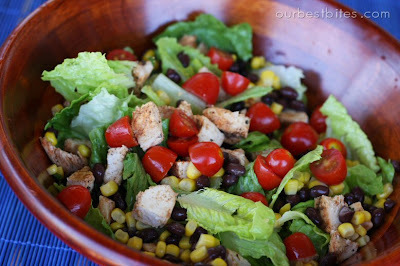 It’s like my favorite Black bean salsa with a creamy dressing and LETTUCE! I would have never thought of that! It’s 7:00 in the morning here and I am already craving dinner! Yum. I always use a fork and knife to cut up chipotle chilis. Wouldn’t think of touching that stuff with my hands! I also cut them on my ceramic plates instead of a cutting board because the sauce stains my plastic cutting boards. But I’m all for adding the chilis! Now this is my kind of salad – it looks GREAT. That is one tasty looking taco salad! BIG hit at my house!! All 3 of my kids loved it. My youngest who has weany taste buds opted for her with homemade ranch, my middle wanted the chipotle dressing but found it too hot, so he added some ranch (a pretty good combo)and my oldest and I braved the spice. Super yummy!!! Yummo Kate, you’re the WOman. I’m glad to know the secret of getting the flavor without the fire. I had a great recipe for Chipotle Sweetpotatoes that was so good until the burn hit… Then I could feel the fire coming out of my ear, nose, eyes you name it. Now I’ll try just using the sauce. Great trick! Totally reminds me of the Santa Fe salad (I think that was its name) that Wendy’s used to offer before it replaced it with a taco salad. I LOVED it and was super sad they discontinued it, so “thanks” to you for posting this! DAMN thank you for introducing me to what will be my new favorite salad… I see a new addiction coming on!! You can’t never go wrong with chipotle. I love how this dish turned out and the pictures are making me hungry! Recently was told about your website and tried this recipe. It was EXCELLENT! I'm sharing it with friends. Thanks! This looks great, looking forward to making this dish! how many servings does this make? I am needing something for a ladies luncheon, so I am out scouting for something like this. Thanks. Oh, looks yummy! I love a good chipotle! Just found your site yesterday. I made the creamy cilantro-líne dressing. It was a big hit at work. Can’t wait to try the chipolte dressing. Just stuffed myself completely full of this meal tonight. It was incredible! (Not to mention a great way to use up a bunch of the stuff from my Bountiful Basket! hehe) Also tried your Brazilian Lemonade and it was to die for. Thanks for helping dinner be a success tonight! This is so so yummy! 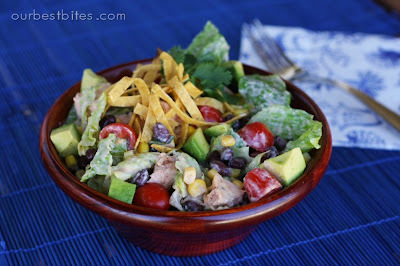 I’m addicted to the creamy Cafe Rio dressing, but this is way easier to make and tastes just as good (if not better!) in my opinion! This was an amazing salad! I actually used plain yogurt in place of the sour cream and it was SO yummy! Thanks for the recipe! was this the one from cooking light? it looks just like it! i made it a couple nights ago and it was great! d’oh! i just saw your cooking light reference! haha i’m glad you enjoyed it too! Have made this salad/dressing before and served it over grilled quesadillas. It’s fantastic. This salad is awesome! I am a huge fan of ANYTHING chipotle or with adobo sauce but this is one of my favorite recipes! My husband isn’t a big cilantro fan ( poor guy) but he didn’t even taste it in this one because of the well-mixed flavors. We added crushed tortilla chips and shredded some sharp cheese, definitely a salad to share with friends. Love it! Thanks ladies! What do you mean by saying “taco chicken” is it a seasoning or some recipe? Where do i get it?